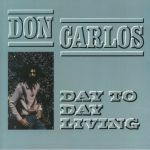 Review: Arguably no producer made a greater contribution to the Italian dream house sound - that most loved-up of deep house sub-genres - than Don Carlos, AKA Carlo Troja. If you need proof, then we advise checking out this collection of overlooked gems hand-picked by Echovelt Records. Opener "Inspiration" (taken from 2001's The Music On My Mind LP but reminiscent of his early '90s work) and closer "Moment" are both pure distillations of the colourful, sauced-eyed ethos of dream house. "Ambient Underground" - one of three selections from 1993's Aqua - is more tech-tinged and hypnotic, despite the presence of a spine-tingling breakdown, while "Dharma" is closer to his New Jersey-inspired work with Stefano Tirone under the Montego Bay alias.